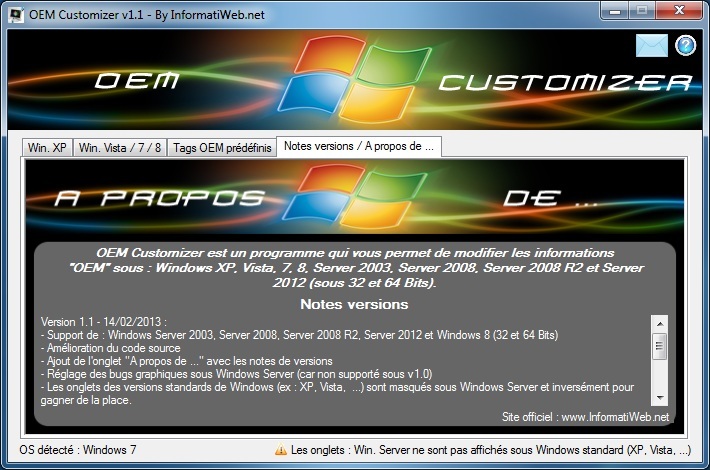 OEM Customizer is a program that allows you to modify the OEM informations in Windows XP, Vista, 7, 8, Server 2003, Server 2008, Server 2008 R2 and Server 2012 (in 32 and 64 bit). Here is the program in differents versions of Windows. 50 tags OEM integrated since version 1.1. And "Notes versions / About ..." tab. Tabs standard versions of Windows (eg XP, Vista, ...) are hidden in Windows Server and vice versa to save space. Includes 50 Tags OEM applicable under all versions of Windows supported by OEM Customizer. You can also find ours "InformatiWeb Computer" tag. 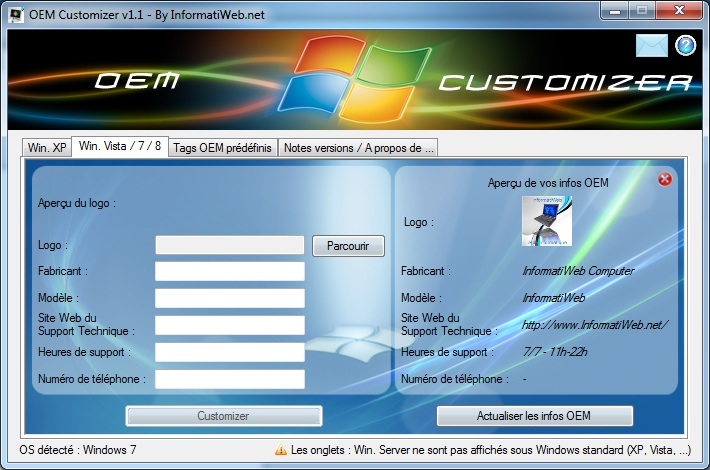 Vidéo de notre programme "OEM Customizer" disponible sur notre site :Français : http://www.informatiweb.net/vbnet/2--oem-customizer.htmlEnglish : http://us.informatiweb.net/vbnet/2--oem-customizer.htmlConseil : Cliquez sur "HD" et affichez la vidéo en plein écran pour une bonne qualité d'image. This software has been published on our two forums on Windows (Vista World and Seven World).